Any civilization is in need of, and functions from, Civilization Principles. The lack thereof, has caused a degradation of man and mankind. These introductory tools are designed to prepare one with simple concepts of civics for civilization and civilized people.  The "Bull Inter Cataera -- which describes the Conquest Intent with no uncertain terms; The story of "Rebecca" with 2 Nations in her womb; The not so exposed or believed, yet true, "Yaqubian Experiment" (erroneously told as Darwin's Theory); Great Law of Peace from the Iroquois; "Treaty of Peace & Friendship", attachment to Organic "Constitution for the United States of America. CLICK FOR CONTENTS / PURCHASE. Knowing something and appying it are two different matters. Once one has come into the knowledge of civilization principles, which are essentially Divine Principles that create common law, it is then necessary to apply the principles to create harmony with man, the earth in which he domciles upon, and the Universe. This category contains the bulk of booklets offered. From The Cosmos To Me (Cos-Me-To-Logy). Astrology is the Science of The Universe. The Zodiac Wheel is a teaching tool to teach children, or initiates, students, the characteristics and energies of Man. It is an elementary elemental and fundamental teaching tool. Information, published by Noble Drew Ali, a Universal Prophet, 1913 -- 1929. One will find, upon review much of it applies to the social climate today. The lesson provided in the 101's are masterful keys to Uplifting of Humanity. The "Circle 7 Koran", divinely prepared by Noble Drew Ali, is an oracle regarding every facet of one's life. "Moorish Divine and National Movement" booklet includes 3 of the most impacting Civic / Law directives of Prophet Noble Drew Ali. Recently added is "M.S.T.A. Degrees" w/ 7 Tests and answers. 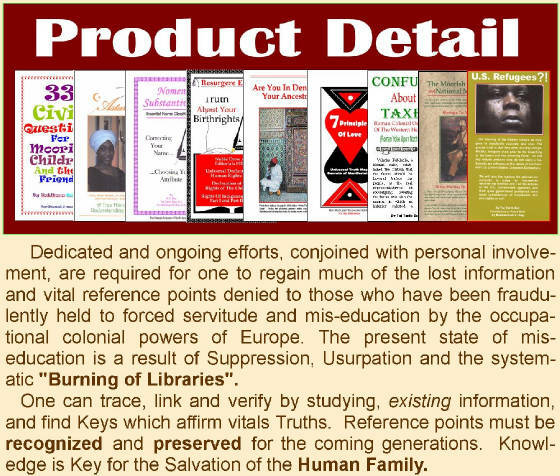 Also included herein are the "Oral Statements of the Prophet", "Mysteries of the Silent Brotherhood" (Higher Degrees) "Bringing the People Back To The Constitutional Fold Of Government" (includes review of COINTEL infiltration), and "Administrative Functions"
Moors Heritage Series, wirtten by Taj Tarik Bey, in-depth explanation of moors in "Moors Defined"; "Protocols of Liberty" Indispensable is the lesson for all Indigenous people regarding the Dred Scott Case, filed as "Plaintiff in Error"-- find out why; and How to operate Courtcourt "Lesson Book #2". Some prefer listening to a book, while traveling, working, doing housework, or homework. 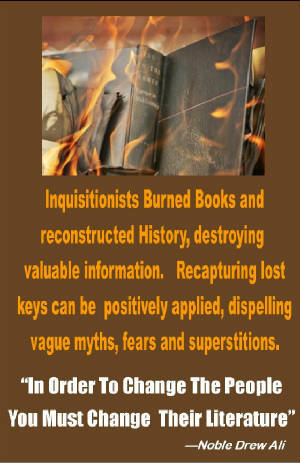 The first 4 Introductory Books are in "Return To Civilization". "Are You In Denial Of Your Ancestry? ", a must even if you think you are not in denial; "She Redeems", for everyone, particularly women, guide for her relations and those who relates to and with her. Talking Books consist of 2 CD's (wav file), professionally packaged. Lectures on CD thus far are "Woman, Her Sons & Government", includes history here in North America. A candid recording, "Dangers Of The U.C.C. ", recorded in Hartford, Connecticut. Much of our classes in New York, are available on "Harlem Rising Internet Radio". National Identification Card. To have an Identification card from a corporation, places you in the jurisdiction of that corporation. The Identification card(s) are not issued or administered under any club, association, private membership, etc. It is a universal card with a rotarian complexion, as such it is for all Moors in America, Moor American Nationals. Right To Tavel Card. The 'Right to Travel' upon the roadways and highways is a 'Personal Liberty' and a state cannot convert a liberty into a privilege, license it, and attach a fee to it (Murdock v. Penn., 319 US 105. In the instance that they do, and they have: "If the state converts a liberty into a privilege, the citizen can engage in the right with impunity." Shuttlesworth v. Birmingham, 373 US 262. The bearer of the 'Right to Travel Card' exercises their un-alienable Right to Travel over land, air and sea. The Student Card is of special importance to us, as if you have attended classes via various venues we have attended, or if you receive information shared on this site you are a Student not only of Moors Heritage and History School in association with the Moors Order of The Roundtable, you are a student for life of the universe in the interest of the posterity of the national family. BE SURE TO SEND US THE APPLICATION WITH NECESSARY INFORMATION TO ESTABLISH YOUR CARD(s). It is found at the very bottom of the National ID and Proclamation page. We suggest you read that page in its entirety, if you have not already done so. You can send the application either mail or email. From Time to time, we will provide congressional records in Lesson Book format 8.5 x 11 for your review of the facts that formed certain Acts made by governing administrations. These records are vey unveiling as to where, what and who an action was determined, which assist in knowing where, what and who it was established for. Often time it becomes clear that they were NOT meant for the natural people. Because they are copies out of the congressional records, they are usually in small print.